Buying the best double pushchairs is a crucial decision for parents with more than one young child and especially so for parents of twins. A double stroller should let you move with both your children effortlessly. Consider comfort, safety, durability, ease of handling and costs when making a decision. Here are some insights to help you get the best double pushchairs in 2018. 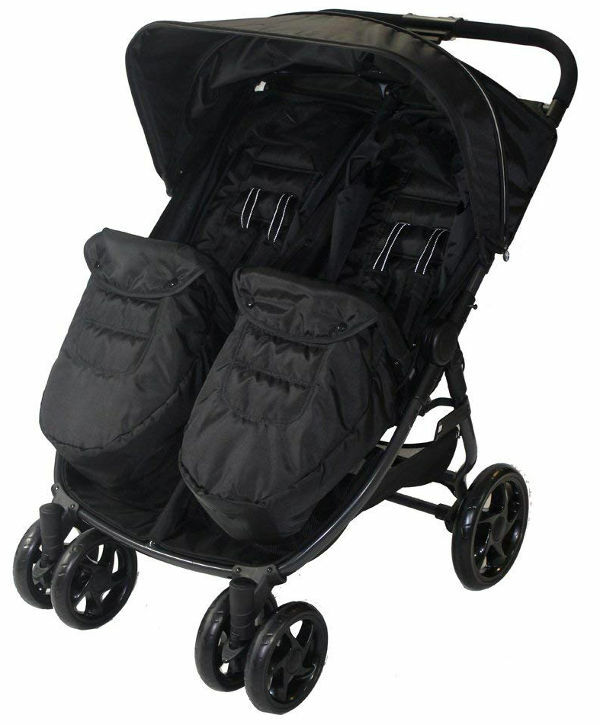 All three double strollers are readily available in the UK and are a great buy. 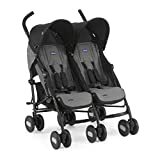 If venturing outdoors with your twins or two small children is a logistical nightmare, you will certainly love the Britax Romer B-Agile Double Pushchair. 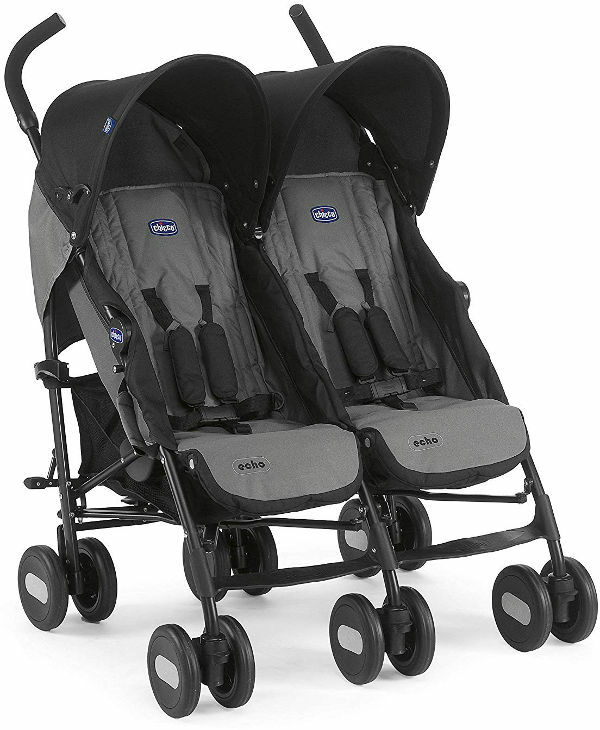 Compact enough to fit through a standard door, this double buggy lets you step out in style. 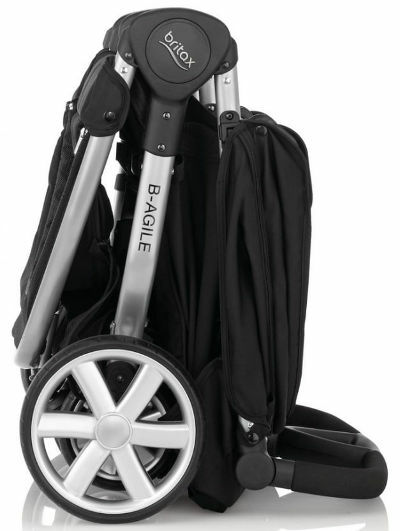 An adjustable handle lets you and your partner keep the buggy at the most comfortable height while on the move. 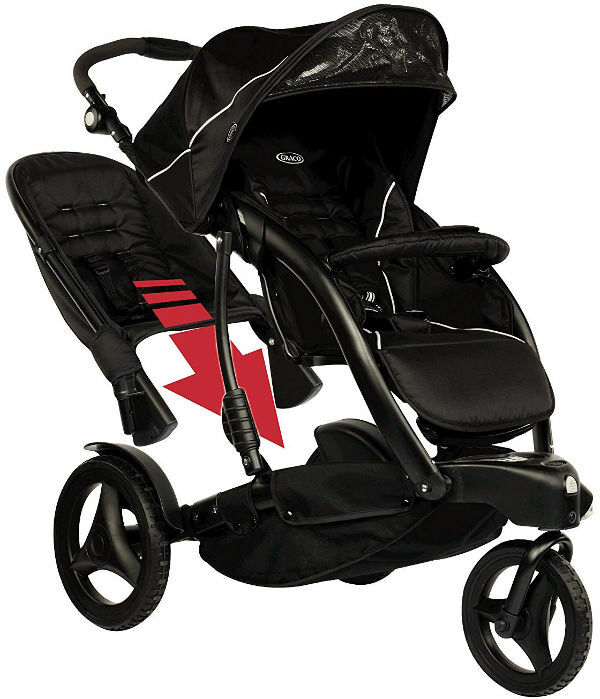 A central grip area gives you total control over the stroller by allowing you an effortless one-handed steering control. The smart fold mechanism makes setting up a complete bliss. With a one handed pull, you can unfurl the buggy or fold it away after a lovely day out in the sun. 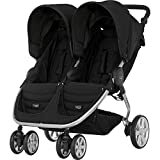 Best of all, the double buggy remains free standing even in the folded position, meaning you never get to exert your back at any point when using it. The lockable swivel front wheel makes for excellent steering ability leaving you to enjoy your walk as your bond with your little angels. A multi-position reclining ability on each seat lets you set up the buggy to suit the needs of each of your children without inconveniencing the other party in the ride. 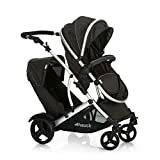 The lay-flat capability makes the double stroller an excellent choice when you already have a toddler and are welcoming a newborn to the family. 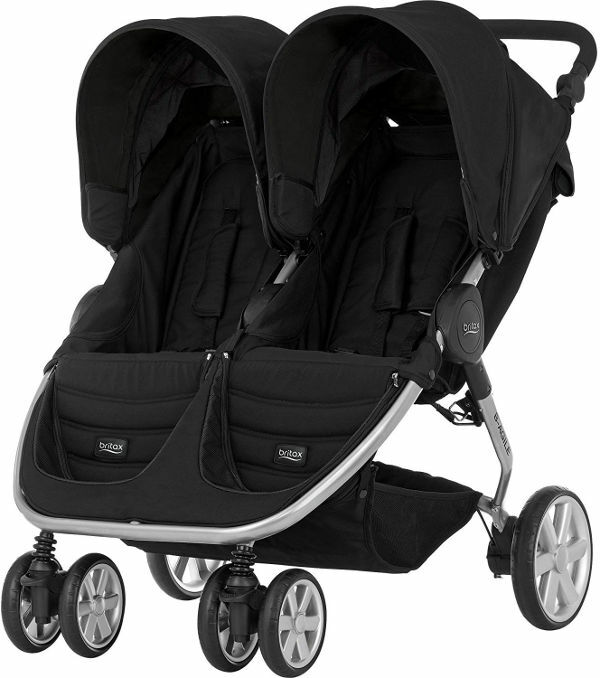 The double buggy weighs 15 kg and measures 105 x 78 x 104 cm. If you are in the market for a modern double stroller with a touch of versatility, you’ll love the Graco Trekko Duo Stroller. This three-wheel stroller lets you step outside in style with both of your little angels right from birth until they are around three years old. 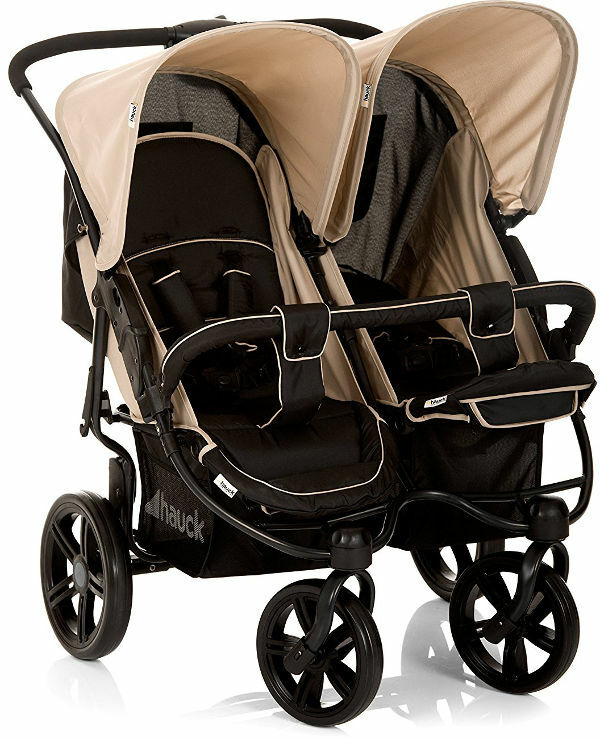 What’s more, the double stroller converts into a single after your broods are grown to keep the fun going. The tiered stroller boasts a primary and secondary seat to let your little ones ride in style. A height adjustable handle means that you can keep the double pushchair at a level that feels natural for an easy push when taking your little ones for a lazy stroll in the park. The convenient one hand fold means that you never have to exert yourself or risk back injury when setting it up or folding it away. The secondary seat is removable for ease of storage after a lovely day in the outdoors. 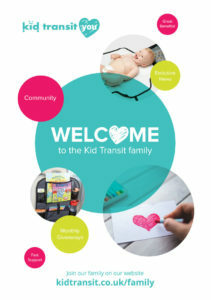 The primary seat, at the top of the stroller, boasts 3-recline positions to suit the needs of a newborn baby as well as those of older toddlers up to the age of around 3 years. The secondary seat, at the bottom, suits the needs of babies who are between six months and two years. The versatility of this double pushchair makes stepping out with both your babies a stylish and classy affair. Each of the seats boasts a 5-point harness to keep your precious cargo safe at all times. Pairing the Graco Trekko Duo Stroller with junior baby 0+ car seat transforms the double buggy into a safe and comfortable travel system that adds a dash of style and class when travelling with your wee ones. 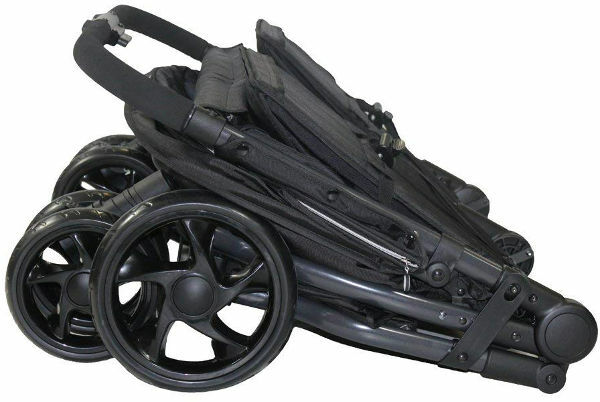 The double pushchair weighs 16 kg, measures 125 x 66 x 106 cm unfolded and folds to 55 x 66 x 125 cm. 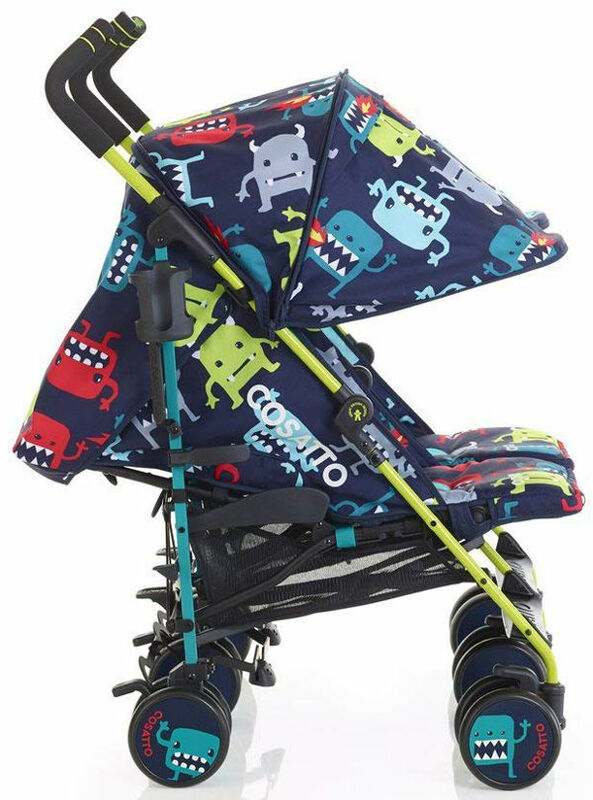 If colour, comfort, style, and elegance is just your style, you will love the Cosatto Supa Dupa Twin Stroller. 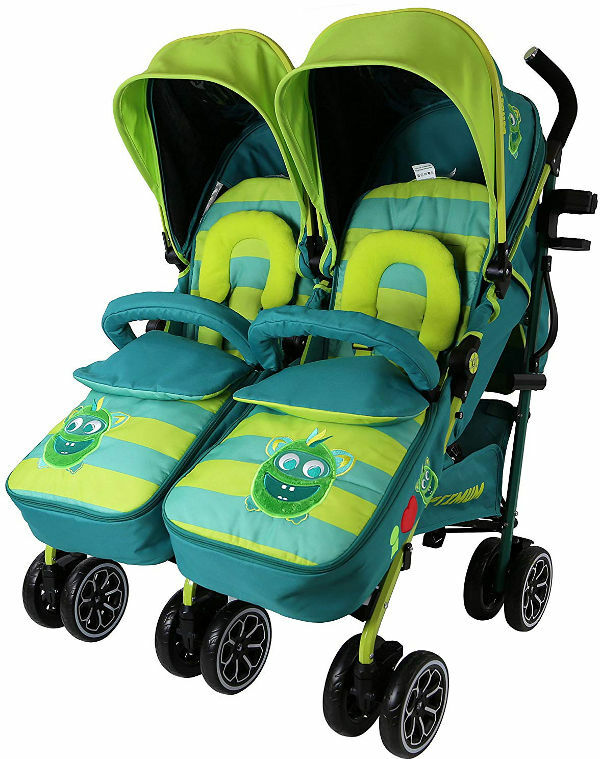 Lightweight, comfortable and slimline, this double buggy lets you show off your little angels in style every time you step out for a walk about town or a trip to the shops. Gadget display pockets mean that your little ones can keep up with their favourite cartoons and shows when you need to rush to the shops. The extendable sunshade boasts a UPF50+ protection to keep your children safe from harmful rays of the sun as you savour the lovely summer weather. What’s more, the speakers on the hood lets you hook mobile gadgets to give the little ones an immersive viewing experience as they enjoy their favourite shows. Each seat boasts four recline positions that are independently adjustable to ensure each of your little passengers sits in the most comfortable position as you embark on a crazy outdoors adventure. The newborn recline lets you cater to the needs of a newborn as well as older babies with great ease. Headhuggers and chest pads on each of the seats keep your little ones safe and comfortable in the luxurious surrounding. The adjustable leg rest with closed footmuff and reversible fleece lining adds a touch of luxury to make each stroll super comfortable even in the harshest of weathers. Kangaroo pouches keep their little fingers warm and cosy while the compact aluminium fold keeps your little ones safe and dry in case you’re caught up in a little rain. 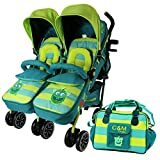 We’ve chosen the best cheap double strollers available for immediate delivery in 2018 and included reviews from selective parents just like you. 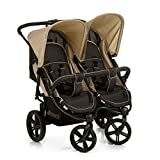 If you’re lost on what features make good value in the purchase of a twin stroller, our guide is exactly what you need. If high quality and attention to detail are high on your list of must-haves for a double pushchair, look no further than the iSafe TWIN OPTIMUM Stroller. Voted by many to be the best double stroller in the world, the iconic design of the iSafe TWIN OPTIMUM will win you over at first sight with its sleek design and clever style and fabric colours. Designed for two children with a maximum weight of 15 kg each or 30 kg total, the absolute highest attention has been paid to every detail and feature of the iSafe TWIN OPTIMUM double stroller. Only the best quality materials have been used in the construction of the iSafe, which was designed in the UK. The iSafe includes a drop-down hood design, constructed with a clever tablet pocket for easy viewing by your child to keep them entertained. Suitable from birth, the seating system is fully adjustable as your children grow from birth on until they don’t need a pushchair. The iSafe double stroller has large swivel wheels and an easy brake system as well as a luxury 5-point harness system for each seat. Soft head support, a large shopping basket and all-over rain cover round out the double pushchair from iSafe. The iSafe TWIN OPTIMUM stroller weighs 16 kg and measures 100 x 48 x 40 cm it features a one-handed folding system as well as washable fabrics with full instructions on assembly. 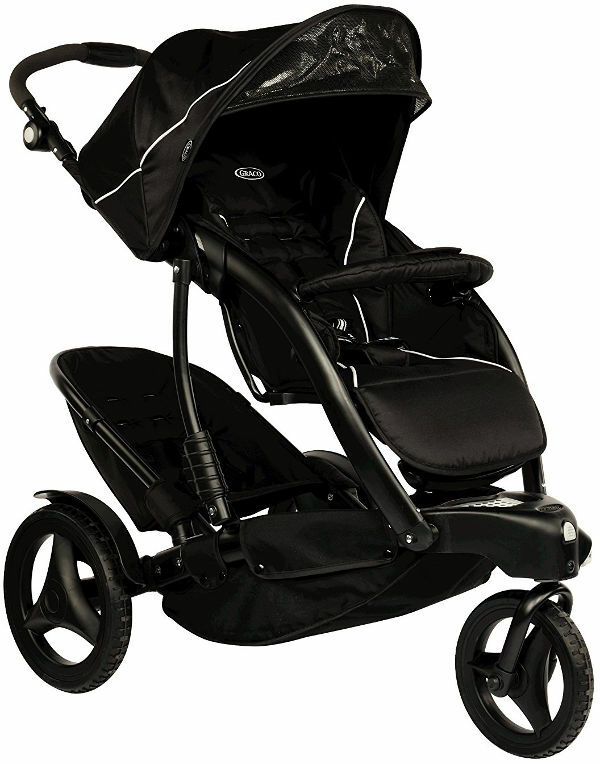 The Twini Jogger from Red Kite is a well-built twin stroller with a sleek design that can be used from birth. Each seat reclines independently to horizontal so naps are super comfortable. The 5 point safety harness is easy to fix and will keep your little ones secure in their seats and there is a separate bumper bar for each seat. The hood covers both seats well and has a viewing/ ventilation flap in the back so you can easily check if your child has woken up. The jogger style of the double buggy, as well as the larger wheels, makes this buggy perfect for any off-road walks as well as bumpy city streets. It is also light and manoeuvrable enough to take with you for a jog so you can still enjoy your workout even when you’re looking after the children. 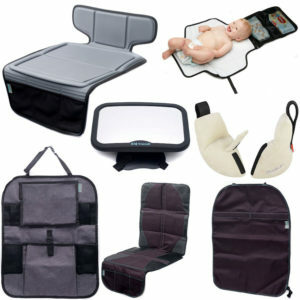 The Twini can be folded to fit in the boot of a small family car with an easy folding motion. 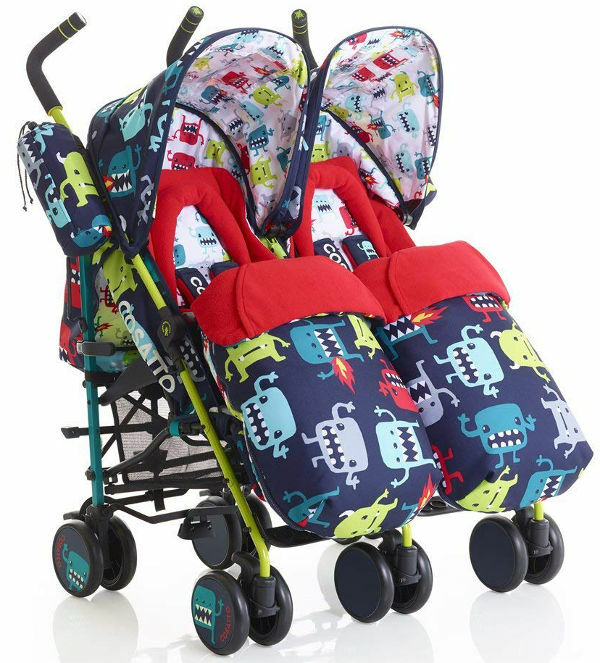 This double buggy also comes with two footmuffs that fit perfectly to the seats and a raincover so you can make sure your little ones are dry if you get caught in the rain. 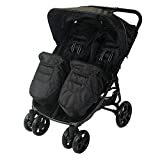 The Chicco Echo Twin Stroller is one of the best choices for a cheap double buggy that you can find online. The Chicco Echo has a lightweight frame, making it easy to manoeuvre up hills and through city streets. Both seats fully adjust individually as does each hood so you can have one child asleep while the other enjoys the view. The hoods have a removable rear panel to allow for ventilation in warm weather. The seats are comfortably padded and can be adjusted individually with just one hand. 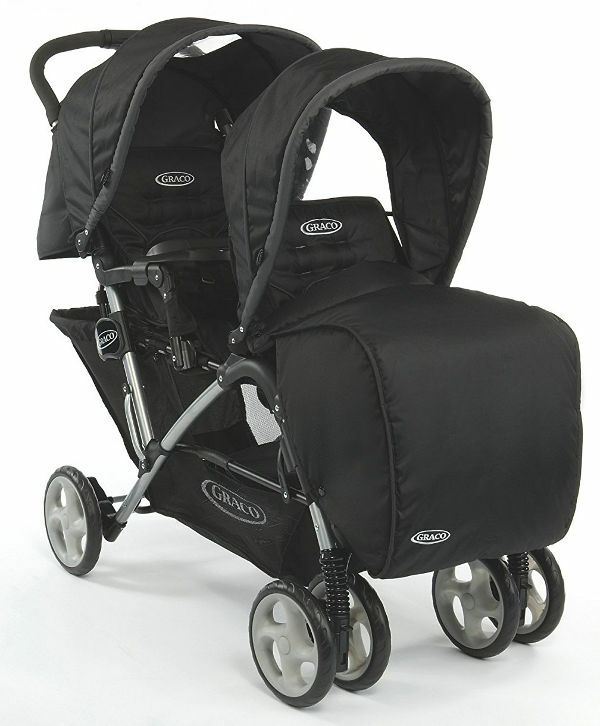 The Chicco Echo Twin Stroller completely folds and includes a carrying handle for ease of storage and portability. The Echo has a practical width that makes it perfect for everyday use for children from birth to three years old. The Echo features a fully adjustable 5-point safety harness as well as including a shopping basket and rain-cover. At 15 kg, the Chicco Echo Twin Stroller measures 108 x 78 x 82 cm and is suitable for two children with a maximum combined weight of 30 kg. 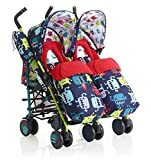 Needing a buggy for a newborn and a toddler is a specific problem as you need to consider two different sets of requirements. A newborn will need a seat that can lie completely flat and has great protection from the elements as well as cushioning from the terrain. A toddler will likely want a seat that they can see out of as well as being easily accessible of your toddler likes to get out often for walks. As it’s a double buggy, it will inevitably be heavier than the single you are already used to. So look for something lightweight and possibly foldable so it can go into your car boot or a cupboard at home. Also, remember to consider whether a side by side double buggy or a stacked one is the best option for you. 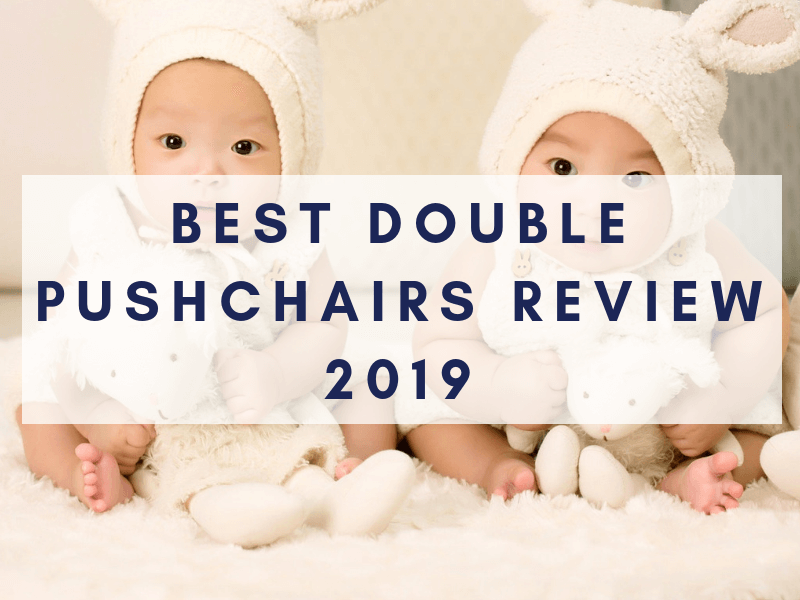 This up-to-date review of the three best double pushchairs for a toddler and a newborn has the most information on recent models that you can find anywhere and is required reading for parents of two little ones or one and one on the way! 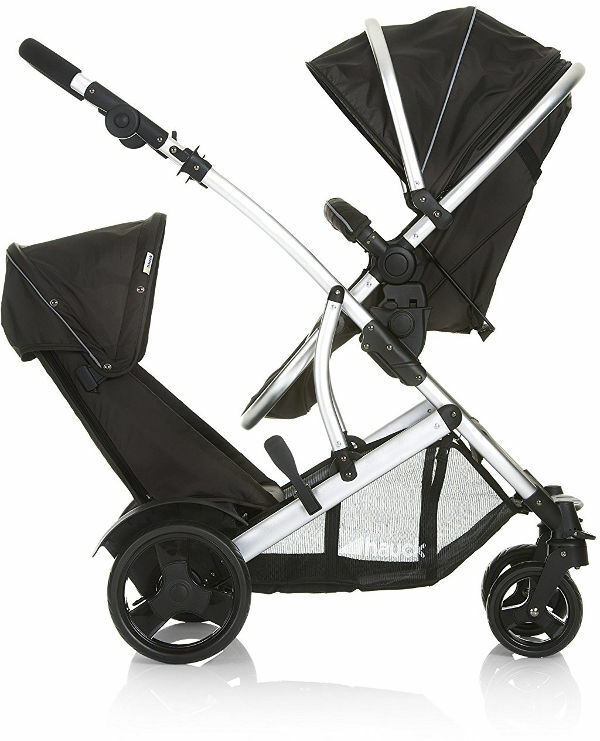 No review of the best strollers on the market would be complete without a Hauck model, and the Hauck Duett Twin Pushchair is included here because it is absolutely everything you could want in a sporty, stylish, safe twin stroller for toddler and newborn children. The Hauck Duett Twin Pushchair features a clever design, with a carrycot that is convertible into a sporty buggy seat plus a removable second seat. The Hauck Duett Twin Pushchair is the perfect solution for families with two children of two different ages and sizes. A true quick-change artist, the stacked style saves space while being roomy enough for each child and fully adjustable. 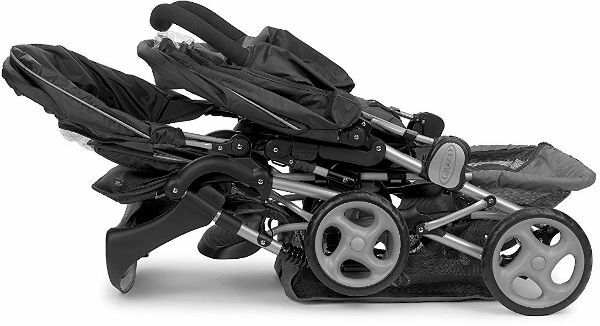 The aluminium frame is lightweight and features lockable, swivel front wheels and an adjustable height handle so you and anyone else pushing the buggy can be as comfortable as possible. Each seat has a 5-point safety harnesses and adjustable foot and backrests to make the seated or reclined positions perfect for each child. The most convenient part of the Hauck Duett Twin Pushchair is the removable lower seat; when your older child would rather walk or if you’re only travelling with the younger child, this space is easily converted to storage space, offering unlimited flexibility and mobility. 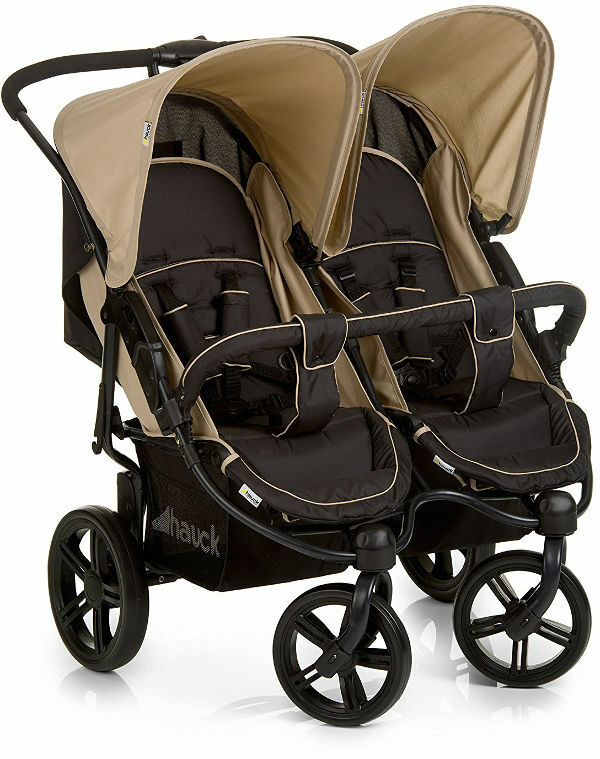 The Hauck Duett Twin Pushchair weighs 16 kg and measures 111 x 67 x 105 cm and comes complete with rain covers for both seats. Graco does it again; style, functionality and value all in one with the Stadium Duo Double Pushchair. Stadium style seating gives both children better visibility to keep them happier while you’re strolling along. Each seat has adjustable recline positions; two for the front and 4-positions for the back plus a large canopy over each seat. The front seat is designed for children from 6 months to 3 years while the back seat since it lies flat, is suitable from birth to 3 years. The Graco Stadium Duo Double Pushchair is complete with Graco’s one-hand fold system for easy storage and portability. The frame is compact yet durable, with locking front wheels, a spacious shopping basket and parent tray, and removable child trays. Two 5-point safety harnesses restrain each child securely and the canopies have been tested for ultraviolet protection so provide sunscreening during hot days. Days out have never been so easy or looked so good with the Graco Stadium Duo Double Pushchair. 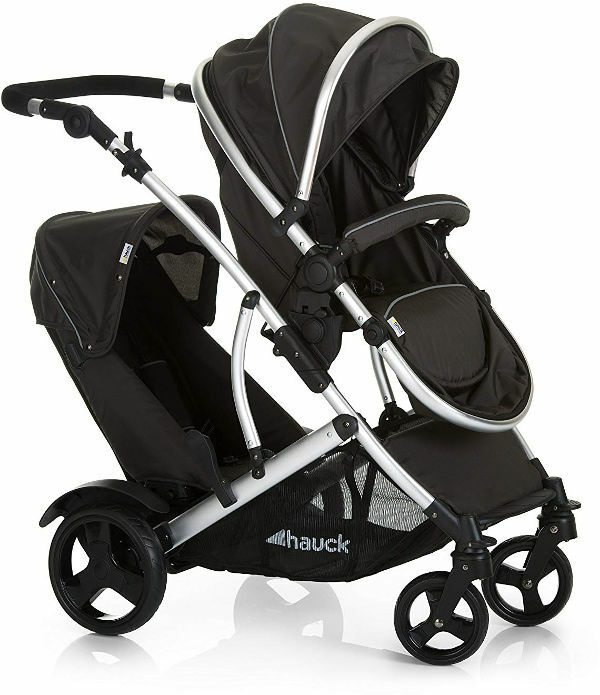 If you think a side by side buggy will suit your needs better, then go with the Hauck Roadster. 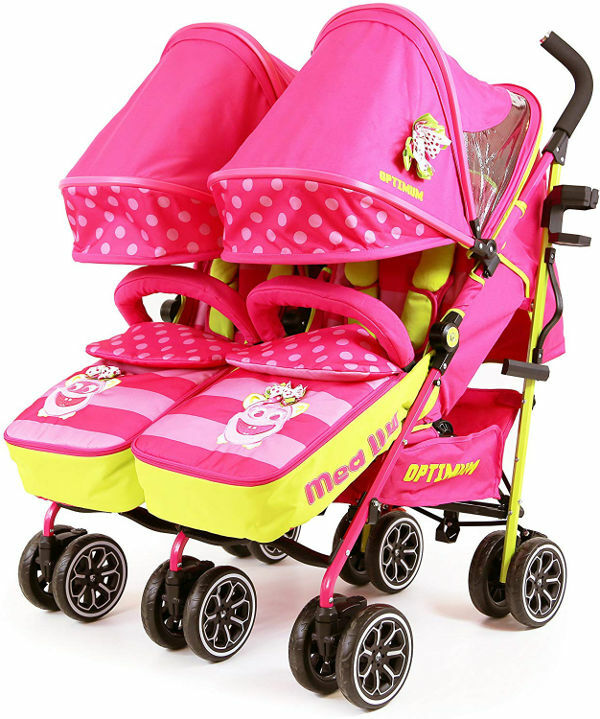 The build quality is strong and the brand is really reliable for delivering a high quality buggy at a reasonable price. Friends of ours have this model and the manoeuvrability of the double buggy as well as the lightness means it’s still comfortable for long walks both on pavements and on rougher terrain. Both the seats can lie flat so it is suitable for newborns. Being a side by side design has some drawbacks as it is wider, but it also means both children can look out of the pushchair so a good idea if you’re children are close in age so you are likely to use a double buggy for longer. The hoods come down to cover the seats well and the set includes a great raincover with acccess flap. Both seats have 5 point harnesses for safety and a bumper bar. The front wheels are lockable and the back break is easily operated by foot. The pushchair also has a one handed folding mechanism so you don’t need to struggle putting the buggy away. The Hauck Roadster weighs 16.5 kg and is 87 x 77 x105 cm. Hopefully we’ve given you some great options depending on your needs: whether for twins or a newborn and a toddler there’s a great double pushchair to suit you. Even if you have a small budget you can still get a double buggy that will be lightweight or that you can take off-road. And for the style conscious there’s always an option with gorgeous patterns or sleek, minimal designs.